Pinakurat and Dayok are two odd sounding names for someone who is not a native of Davao. Both are native dips (“sawsawan”). Pinakurat is a coconut based vinegar. Based from the info on the internet, it is a native of Iligan City. It is said that pinakurat is a blend of fermented coconut, salt, spices, with hot and sweet chillies. Its more expensive than ordinary vinegar maybe because of the “extra processing” than the normal vinegar. They say that when you use pinakurat in your daily meal, you’ll have to forget about the word “DIET” coz it really increases your appetite. And I highly recommend this to beer drinkers along with their “pulutan”. And yes! i can attest to that. I’ve tried this on Danggit, fried fish, lechon, grilled pork..
Pinakurat is available In Metro Manila. Check out those big supermarkets. It is even available abroad. Check out the comment here. Although at first it was hard to sell a virtually unknown product, Del Rosario’s Suka Pinakurat eventually caught the attention of big retailers that have operations in Cagayan de Oro, Davao and Cebu. 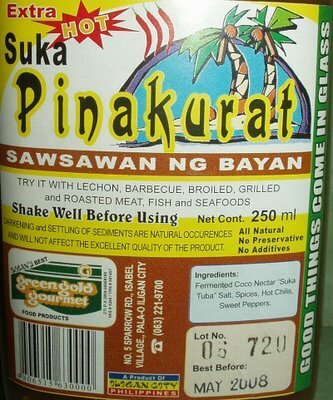 Suka Pinakurat even made its way to most Visayas and Mindanao regions that direct buyers and distributors took advantage of the product’s marketability. The increasing demand for Suka Pinakurat forced Del Rosario to increase his volume of raw materials and suppliers. Sukang Tuba is purchased directly from coconut sap farmers, locally known as the mananguetes, who are considered the poorest farmers because they only depend on sari-sari stores and local markets. When Del Rosario decided to increase their produce, these former less-than-P100-earner mananguetes now earn roughly four to five thousand pesos per week. Meanwhile, Dayok is a mixture of different fermented fish intestines (they say intestines of danggit). Its like patis, but THEY say Dayok is better.. Tried it. tastes OK for me. The smell is lighter than patis. Furthermore, they say (again) that dayok is cleaner than patis – the processing and finished product. But i can’t stand the look of dayok in a bottle.. thinking that its fish intestines. But once its out of the bottle and on the plate, then the dipping starts. So, if your in Davao, make sure to try pinakurat and dayok. Ano po ba anh history ng dayok?